Welcome to the 2015-16 and 2016-17 Vermont Press Association Awards. This year, for the first time, we are accepting entries online only. You will find detailed instructions on how to upload entries within each award description. It is vital that entrants follow the file-name conventions described in each award; please follow the instructions carefully. We have extended the submission period to six weeks (deadline Sept. 22, 2017 for both 2015-16 and 2016-17 entries). Submission links are at the bottom of this page. As you can see, we are also catching up on two years’ worth of awards periods. With this in mind, we are asking for only one entry fee per newspaper to cover both award periods. Please find payment information below. Awards for both periods will be presented at our fall 2017 banquet (date TBD). Thank you for participating in the awards process and highlighting the quality journalism being produced in our state every day. We look forward to seeing you in the fall. Click here for a printable PDF of these rules. Stories that appeared only on a newspaper’s website but not in print MAY be entered in any category. All entries will be PDF files uploaded to the VPA Dropbox account (see links within the individual categories below), using the naming conventions specified in each category. With the exception of the Donoghue and Photography Awards, entrants should be full-time reporters or regular correspondents with a newspaper circulating in Vermont. Student newspaper entrants shall be regular members of the editorial staff. Newspapers may submit only those stories that have been published in their newspapers or on their websites. In other words, no newspaper may submit the work of a new hire if the work was originally published by the journalist’s previous employer. There may be three place awards (first, second and third) in each category, with the exception of the Mavis Doyle and Rookie Reporter Awards, for which there will likely be only one winner. Judges retain the right to award all or none of the three places in each category, depending upon their evaluation of entries. Judges retain the right to disqualify entries entered in incorrect categories. All entries must be clearly marked with the category and the date published. No newspaper may submit more than the noted limit for entries in each award category. Submitting more than the maximum numbers of entries subjects the entire entry to disqualification. 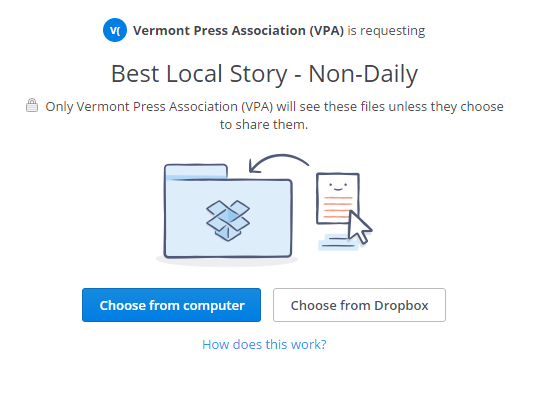 All participating organizations must be eligible for regular membership in the Vermont Press Association. If you send full pages, you must include an index for judges so that they can determine which articles to judge. See awards descriptions for details on indexes. Winners are announced at the annual banquet. All journalists with submissions are encouraged to attend the publicly announced VPA banquet. Individual winners should not expect advance notice or special invitation to the banquet. Entries are submitted in the name of the newspaper. Extra copies of awards may be purchased from the VPA. This year, the VPA is transitioning from hard-copy submissions to digital entries. We hope this saves time for entrants, volunteers and judges. It is vital that entrants follow the file-name conventions described in each award; please follow the instructions carefully. You will find detailed instructions on how to enter each category at the submission link. However, we realize this is a new process, so we have put together this step-by-step guide to the speediest way to enter this year’s contest. IMPORTANT: Take one entry at a time. You will save time and energy by gathering and naming your all of your entry files PRIOR to initiating the upload process. 2. Once you have created all of the PDFs for a particular entry, rename the PDFs according to the particular award guidelines. 3. Next, if the award guidelines require an index, you can create one by downloading the VPA-Sample-Index and editing it/filling in the blanks to match your entry. Then, rename the file according to the award guidelines. Verify you are working on the correct award. Click “choose from computer” and choose all of the PDFs and indexes for THAT AWARD ONLY. 5. If you do not have a Dropbox, you will be asked to provide your first and last name and email address in order to receive a confirmation receipt. 6. When you are done, click “upload.” You are finished and ready to move on to your next entry. Before contacting these volunteers, please make sure you have reviewed the “how to” steps above. Need help with PDFs, indexes and/or Dropbox? Contact VPA board member Maggie Cassidy at 603-727-3220 or mcassidy@vnews.com. Need help with EXIF/metadata in photos? Contact Valley News photo editor Geoff Hansen at 603-727-3247 or ghansen@vnews.com. Have questions about the contest in general? Contact VPA president Adam Silverman at ASILVERM@burlingt.gannett.com. Payments must be postmarked by Sept. 22, 2017. Click here to submit to the 2015-16 awards. Contest entries must have been published from July 1, 2015 to June 30, 2016. Submission deadline: Sept. 22, 2017. Click here to submit to the 2016-17 awards. Contest entries must have been published from July 1, 2016 to June 30, 2017.